"Very rare opportunity to buy a completely new and - one of the first (january 1989 date) Custom shop Masterbuilt Fender Stratocaster Custom shop masterbuilt by Fred Stuart. Probably the rarest custom colors of all!Possibly a one of piece featuring Brazilian fingerboard, Custom color and TOTALLY MINT AND NEW CONDITON! Not even a scratch on the plastic that is still on the pickguard!!! All tags, Certificate, hangtags, original case and case candy included. Beware this is completely new guitar aged for another 19 years!The magic of early Custom shop is the best choice of woods you can imagine.. The tone simply beats all my other Strats - even the older ones! It came from a collection of 20 guitars that are untouched! Fred Stuart, JW Black, and John English are the Senior Master Builders at the time. Likely the choice of wood simply was better in the early custom shop era. Everything is new and untouched. The tweed case with brown interiour was standard feature on Custom shop guitars and period correct. Not many 1962 Custom shops Strats were ever made in Custom shop masterbuilt quality. 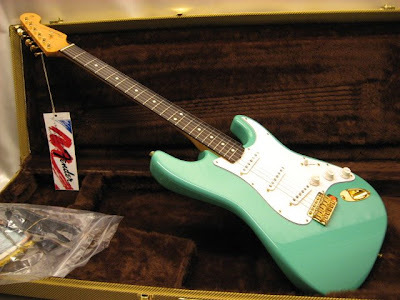 This factory Sea Foam Green is not only a lightweight, it's tone-heaven! The early custom shop models are sought after, especially the “masterbuilt” examples. I never seen a Totally new guitar in a color almost unseen like this before and probably will regret selling it. It should be appealing to any collector of Fender guitars to find an almost 20 year old january early 1989 stratocaster with brazilian board in totally new untouched condition. Incl. original Fender tweed case and all papers/COA."